Gillian and I’s taste in cars is very much the same, we like manual transmissions, all wheel drive, and unique vehicles. I care a little more about engine performance and she cares a little more about creature comforts, but all in all there really aren’t argument about what car to buy. Some may argue that a Subaru Outback and a BMW 325xi are not that unique, but in Grand Island they very much are. I am nearly positive we have the only Subaru Outback in town and I can count on one hand the number of 3-series I have seen. I’m not trying to be elitist, well maybe a little, there just isn’t much beyond Ford, Chevy, Dodge, Honda, Toyota in Grand Island and most people don’t spend most of their weekends in out cities. Anyway, I am rambling again. 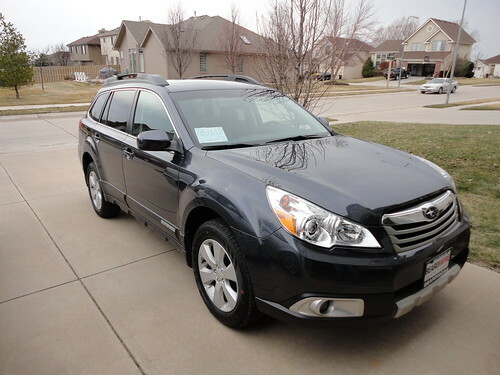 Gillian and I both love this car wagon SUV…umm Outback. Today I am currently sitting in the service center getting Sirius radio installed. We are planning to take a trip to Colorado in a few weeks, the motherland for Subarus, so I really wanted to get the radio installed as soon as possible. We bought the Outback from Beardmore Subaru in Bellevue Nebraska and as a final note I must say I recommend this dealership. I hate buying new cars or going to a dealership for any reason and they didn’t do anything spectacular, but I was never at any point enraged, so that is the closest thing to a two thumbs up you are going to get from me about any dealership. Also if you do come here and buy a car, mention our names and we get $100, so buy a Subaru… dammit! This entry was posted on March 30, 2010 at 10:42 pm and is filed under Baby, Cars, Rants. You can follow any responses to this entry through the RSS 2.0 feed. You can leave a response, or trackback from your own site.